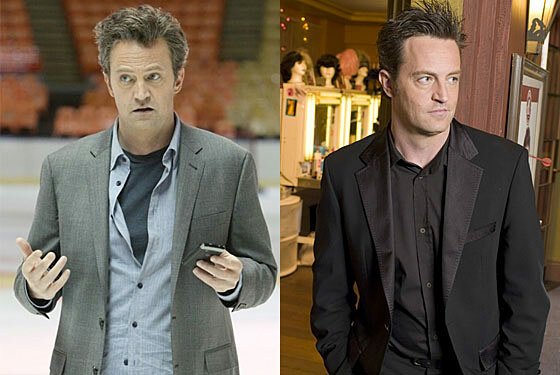 Mr. Sunshine, Matthew Perry’s new sitcom about an emotionally shut-down guy who runs a sports arena, premieres tonight on ABC. There are a bunch of fun facts about the casting of the show — Lost’s Hurley (Jorge Garcia) pops up as an arena employee Perry condescendingly refers to as Bobert (he’ll be back for at least one more episode), and Andrea Anders, who plays Perry’s love interest, co-starred in Joey, making her a charter member of the “I banged Chandler Bing and Joey Tribbiani” club — but none are as weird as this one: Mr. Sunshine is basically a Studio 60 on the Sunset Strip reunion. What, you haven’t been praying to the TV gods for one of those? Consider all the overlaps between Mr. Sunshine and Aaron Sorkin’s famously failed show about the backstage goings-on of a late-night comedy show. First, there’s Matthew Perry himself, who co-starred in Studio 60 as Matt Albie, the stand-in for Sorkin (recovering addict, in love with a Christian). Then there’s Allison Janney, who plays Perry’s character’s zany, clown-phobic boss. Janney is best known for her role on Sorkin’s West Wing, but she did appear, as herself, on an episode of Studio 60, as the host of the show within the show. Third! We’ve got James Lesure (Las Vegas) playing a former basketball player who works for Janney on Mr. Sunshine. Lesure had a multi-episode arc on Studio 60 as Captain Boyle, the soldier who showed up when Nate Corddry’s character’s brother was taken hostage in Afghanistan, and helped resolve that hostage crisis from the Studio 60 offices. (If that sentence is confusing, blame the story line.) Fourth is Nate Torrence, who appears on Sunshine as Janney’s dim, estranged son and played one of the comedians in the cast of Studio 60’s show within the show. Finally, Tommy Schlamme, who executive-produced Studio 60 and directed a number of episodes, including the pilot, directed the pilot of Mr. Sunshine. Also, both of these shows have the word “Sun” in their titles. (There is no coincidence too small!) For Mr. Sunshine’s sake, we hope all of these similarities to Studio 60 do not portend a similar fate. Though, if they want to give Bradley Whitford some work, we’re always happy to see that guy.